Written by Sara Al Sayer, one of the most energetic and playful parents I know... Enjoy! 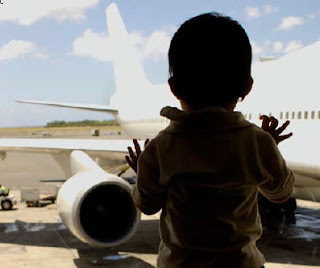 Most parents, myself included, who have traveled with kids, will have horror stories of disastrous journeys. However, we also have the most wonderful memories of holidays with our kids and no matter what kind of hell we went through on the journey, it was totally worth it. I have found, though, that the more we travel with our kids, the easier they find the journey. Living away from Kuwait has made my kids seasoned travelers, and I have picked up some good tips along the way. Before we travel, I like to countdown the number of sleeps we have with my kids until we leave. We talk about where we are going and who we will see and what we will do there. We talk about how many planes we have to take to get there (three to Kuwait from Koh Samui where we live). They choose what they would like to take on the journey and help me pack it into our hand luggage. My eldest has this fantastic bag called a "trunki" (available from Oleana boutique) that he can pull along or ride while I pull it that he puts his toys in. I also make sure that they have whatever entertains them - their portable DVD player, iPad, coloring books etc. I tend to bring snacks for them as airlines typically have a lot of junk food for kids. I bring a change of clothes for them, and for me just in case accidents happen. Some airlines like Emirates are particularly child friendly and if I can, I tend to travel with them. I love that they provide a push-chair for us to use in Dubai. When I travel with a baby (as their prams are not for babies), I bring a baby sling to use in the airport. If it is an overnight flight, I bring their pajamas to help keep some semblance of normality and to help them sleep. When possible, I try to book flights that fit in with their timings so it is not too traumatic for them. If you are traveling with a baby, it is helpful to feed them during take off and landing as this will help their ears to pop. I use a "bebe au lait" breastfeeding cover (destination maternity sell them) which are a fantastic invention - a piece of material that ties around your neck and enables you to breastfeed without exposing yourself to the people around you. It also has a wire running through the top to keep it more rigid so that you can look down onto your baby and see what you are doing. If the baby won't feed then a dummy is also useful. We look for different things in hotels depending on what stage our kids are at. The most important thing though, is that it is child friendly. We look for kids clubs and hotels that have activities for kids. Some hotels will even make pureed veggies for your baby if they are just starting solids. If not, there is a great little machine from munchkin (you can buy it in mothercare) that will puree food for you and it doesn't need any plugs. It's called “baby food grinder”. This is small enough to fit in your handbag so that you can even take it with you to a restaurant. Munchkin also have a netted fresh food feeder that you can put fruit or veggies in for the baby to chew on and the net prevents them from choking on the pieces that may break off. We have recently discovered that hotels with private villas are great for kids because you can put the kids to sleep and then take the monitor and sit outside to enjoy the rest of the evening without disturbing them. 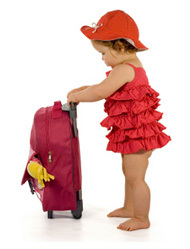 The first time that you travel with your children is daunting, but it is such a fun thing to do if you travel prepared. Try to keep to their routines when possible. Bring a selection of bedtime stories if that is part of it, because it will help them settle. Don't stress if they are not eating all the things they normally eat - a holiday is just a short period of time and it won't harm them to have a few days without veggies. If you end up in battles at every mealtime, you will all be miserable.